The Council removed and recycled 132 tons of bio-waste as firewood, chips to be used as mulch or trucked to Colmac where it was used to generate electricity. 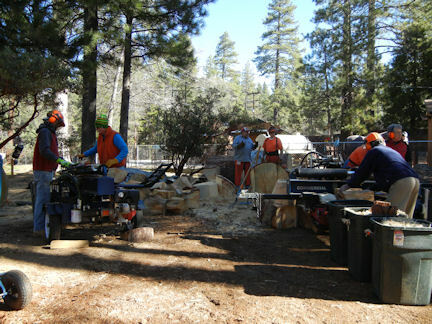 In April, the MCFSC, in partnership with U.S. Forest Service, CAL FIRE/County Fire and Idyllwild Fire, held the first local Fire Fighters Muster. This was a fun event which also provided information to mountain residents about everything they need to know about getting ready for the coming fire season. It also gave everyone the opportunity to meet the local firefighters. This event served as the MCFSC's kick-off to Wildfire Awareness Week. The Council held a contest to select the "Most Fire Safe Homes on the Hill". One home was selected from each of the communities of Idyllwild and Pine Cove. The two winners were awarded a cash prize of $150 and dinner at their local fire station. Twenty U.S. Forest Service fire prevention managers, from the ten national regions, visited Idyllwild to study what can be accomplished in a small cooperative community. The group made a special request to visit with the Woodies. This visit was coordinated by, Turdie Mahoney, Region 5, Assistant Director. The MCFSC assisted the Ramona Band of Cahuilla Indians in developing their Hazard Mitigation Plan. The Board of Directors completed the draft Strategic Plan. The Council intends to finalize the Plan in 2012. The MCFSC continued to work with Riverside County Office of Emergency Services to obtain a FEMA grant. This grant will provide a 75% cost-share for home owners to replace wood/shake shingle roofs with Class A roofing. MCFSC staff and volunteers distributed fire safe educational materials at the Idyllwild Earth Fair and Christmas tree lighting ceremony and gave presentations to local property owners associations. Not only do they serve as good examples by maintaining their properties defensible space, but they also helped bring 10 other properties into compliance with the fire code. These were homes of neighbors who physically and/or economically could not do the work themselves.